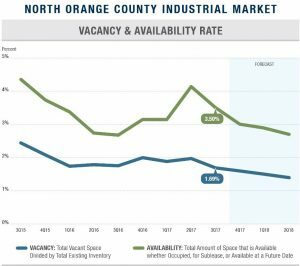 Over the past 36 months, the type of company that has targeted the North Orange County’s commercial real estate space (traditionally this region’s industrial real estate market) has shifted from aerospace and defense-centric, to a more diverse, international blend of service-related companies. Many of the attributes that made this region desirable to large companies over 50 years ago still come into play today and will through 2020. Proximity to talent, an array of residential housing options, a well-planned transportation infrastructure, and access to population centers of Los Angeles and Orange County continue to make this region attractive in a rapidly changing economy. The North Orange County Chamber of Commerce incorporates nine cities, collectively offering its business partners a unique mix of residential, commercial, educational and cultural diversity. A region whose early real estate roots were based in agriculture, followed by aerospace and defense, is now emerging as a target destination for both corporate headquarter facilities and logistics and distribution facilities. This area provides for a unique confluence of executives, principals and business owners with a qualified labor force, along with several higher learning institutions. Several prominent global companies such as Kraft, Raytheon, Alcoa, Albertsons, Beckman Coulter, United Healthcare, Siemens, Yamaha, Bank of America, and ADP have all made substantial investments in office space in the county. As consumer buying patterns have changed over the past 20 years with the emergence of e-commerce, larger logistics providers are now interested in the area, and many have their vision aimed at large blocks of warehouse space (+100,000 square feet). Located in close proximity to the ports of LA and Long Beach, John Wayne Airport, LAX and easy access to Southern California freeways, North Orange County continues to serve as an infill hub for several logistics providers focusing on same day or next day delivery. For example, in early 2017 3PL Global logistics leased the former Yokohama Tire facility in Fullerton (441,000 SF) where they provide distribution and warehouse support services to a wide range of clients. 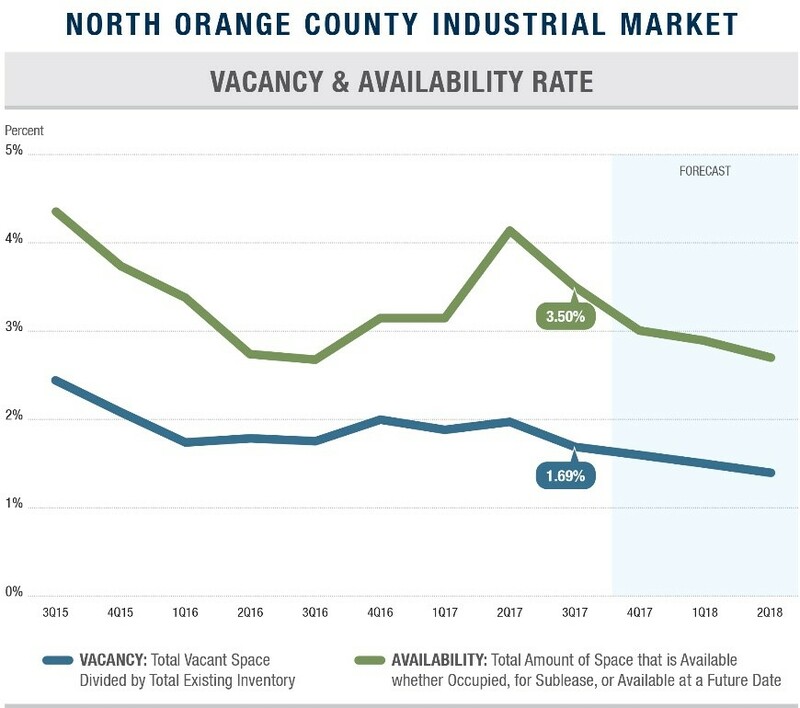 With strong demand for quality distribution space expected in 2018, vacancy rates at record lows, and limited land for future development, real estate investors and developers will continue to compete to control the limited sites in North Orange County to build state-of-the-art industrial buildings. With the recent success of the Anaheim Concourse project on the former Boeing campus in Anaheim, other prominent developers such as Pacific Industrial and Western Realco are experiencing similar success in Brea and Fullerton on large, well-designed buildings. Expect to see continued growth in logistics, food and beverage and specialty manufacturing as well as import/export industries in this market. The strong fundamentals, ideal location and wide array of industries all combine to make North Orange County a primary target for not only domestic capital, but foreign capital as well.